You can save money on your next vacation by going against the flow and visiting popular places during their off-peak months. Our top five picks for low-season travel this summer are North American ski towns, the Caribbean, Australia and New Zealand, Florida, and Costa Rica. Last week, we told you our favorite strategies for low cost, low-season vacations. This week, we’re putting those tips into practice. Winter ski vacations to resort towns like Aspen, Killington, Sugarloaf, Telluride, or Whistler can have an astounding price tag when factoring in the high cost of transportation, lift tickets, ski equipment, and condo rentals. However, when the snow melts and the ski bums move on, prices drop and the mountains become accessible for hiking, biking, fishing, golfing, and more. And, the weather isn’t a problem for most ski resorts in the summerÃ?Â?you can generally expect sunshine and moderate temperatures in these mountain-encircled towns. You’ll save money because hotel rates are significantly reduced from normal winter ratesÃ?Â?some by as much as 50 percentÃ?Â?and many hotels will offer free meals and activities with hotel stays. Restaurants and shops may also lower prices, and many summertime activities, like hiking, are free. These prices are based on the per day “regular” summer and winter prices posted on the hotel’s website. Different rate ranges may be applied during holiday or transitional periods.To find summer package deals and additional discounts in ski towns, try searching the official tourism websites for the resorts. For a complete list of North American ski towns, visit SkiTownResorts.com, and browse by region or through an alphabetical list. 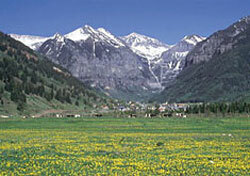 On Telluride’s tourism bureau website, we found deals by clicking on “Specials and Packages.” An example includes a deal where you get 20 percent off hotel rates when you stay at least seven nights at selected hotels in Telluride through August 29. To read about more ski towns and the deals available for summer travel, read Eileen Ogintz’s column Heading to the mountains. Travelers fearing high temperatures and tropical storms tend to avoid the Caribbean in the summertime, driving down occupancy rates and prices. While less than perfect weather is a factor to consider, May, June, and July are still good months for a visit. Being in close proximity to the equator, the Caribbean doesn’t experience huge temperature variations, and the summer temperatures usually aren’t more than 10 degrees higher than in the winter. More rainfall can be expected in the summer, and, according to the National Oceanic and Atmospheric Administration, the vast majority of tropical storms in the Caribbean take place August to October. In the summer, you’ll find that the beaches and pools are less crowded, that you can get into top restaurants without reservations, and that there will be less of a wait for access to activities. In terms of savings, shops put on summer sales, hotels cut rates by at least 20 percent, flights and cruises go on sale, and package prices are lower. These prices are based on the per day “regular” summer and winter prices posted on the hotel’s website. Different rate ranges may be applied during holiday or transitional periods. For deals, try the islands tourism bureau (visit Tourism Offices Worldwide and search by island to link to tourism bureaus), or an online tour promoter that specializes in the Caribbean, like CheapCaribbean.com. Elsewhere on SmarterTravel.com, we report on seven-night air and hotel packages to the Bahamas from $399, Caribbean cruise deals, and a special on flights to Grand Cayman Island. Since they’re located in the southern hemisphere, Australia and New Zealand experience winter during our summer. Thus, the low season begins mid-April with fall, and lasts through the winter to the end of August. During this time, temperatures are a bit cooler, and slightly more precipitation falls. Of course, it gets much colder in the mountainous regions, but you’ll want to avoid those areas because the influx of skiers means higher prices. These prices include taxes and were taken from the airline’s websites and Orbitz. As winter 2004 approaches, these fares may drop in price. For flights to Australia and New Zealand in winter 2003, the SmarterTravel.com Fare Index tracked lower prices than those listed now for 2004. But, the summer fares represent a savings. Check with airlines that fly to Australia and New Zealand for even lower fare specials, and for discounted vacation packages. We found low-price air and hotel packages to Australia and New Zealand from United Vacations, Air New Zealand, and Qantas, including a seven-night Sydney vacation from $1,099. If you only want airfare, we have a roundup of current sale fares. Aside from airfare, you’ll generally find lower hotel and tour rates in the low season, except near ski areas. Try searching HolidayPoint.com for hotel deals in Australia or New Zealand. Temperatures in the 90s, humidity levels near 100 percent, and daily afternoon thunderstorms keep a lot of travelers away from Florida in the summer. But it’s still sunny most of the day, beaches are never far away, and if you’re willing to sweat a little, you’ll find great bargains on hotels, airfare, and attractions. And the theme parks are discounting this summer like we’ve never seen. Read more about summer discounts on Disney World and Universal Orlando vacations in our story on dueling theme park deals. To find special deals, visit the online tourism bureaus of individual cities and towns. Link to their individual websites by visiting Tourism Offices Worldwide and selecting Florida from the drop-down list of states. Elsewhere, we report on air-and-hotel packages priced from $273 for a three-night vacation, and a Florida air sale by Continental. Costa Rica’s rainy, low season runs from May to November. While average temperatures are in the high 60s or low 70s most of the year, you can expect nine to 13 inches of rain per month in the summer, versus half an inch per month in the winter. Local tourism officials have begun billing this period the “green season” in an attempt to put a positive spin on it. Indeed, this is the time of year when the country grows lush and verdant all over, andÃ?Â?most of the timeÃ?Â?the rain is limited to a few afternoon storms a week. You can enjoy hiking, biking, surfing, and all the other eco-activities Costa Rica is known for without too much interruption. For more money-saving ideas, check out EÃ?Â³in O’Carroll’s column on Costa Rica. Summer is also the time for discounted Costa Rica cruises, including a promotion from Cruise West offering 50 percent off children’s fares. Stay tuned to SmarterTravel.com this summer, when we’ll be posting our picks for the best autumn low-season travel destinations.